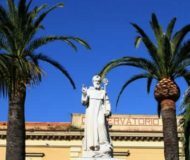 In Sorrento, February 14 is not only Valentine’s Day, since it is also the day when we celebrate the patron ot the city: Saint Antonino (Anthony). Spend February 14 in Sorrento is an opportunity that you cannot miss if you love the traditions and culture. In fact, for Sorrento and its citizens, is the main popular faith event of the year. In addition to religious events during the day of St. Antonino, the main street of Sorrento are filled with market stalls and lighting. Obviously, the most awaited moment is represented by the procession, during which the silver statue of the patron saint is carried through the streets of the City. The day’s festivities ended with the traditional evening show of fireworks. In short, the perfect climate for a loving couple looking for an unusual way to spend Valentine’s Day.